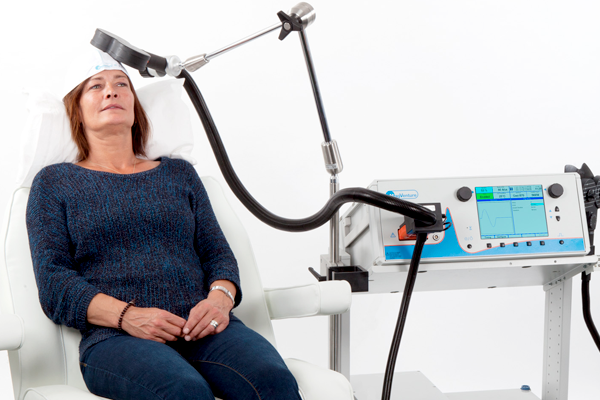 Repeated transcranial magnetic stimulation (rTMS) is a treatment for depression in which magnets placed near the skull stimulate electrical impulses in the brain. In a poster presented at the 2015 meeting of the Society of Biological Psychiatry, Martin Lan and colleagues presented results of the first study of structural changes in the brain following rTMS. 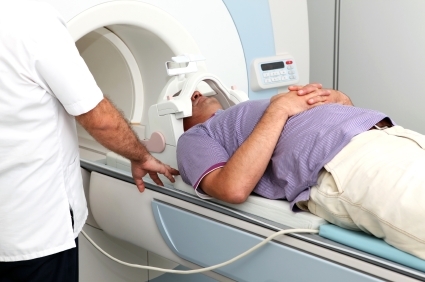 In the study, 27 patients in an episode of major depression underwent magnetic resonance brain scans before and after receiving rTMS treatment over their left prefrontal cortices. 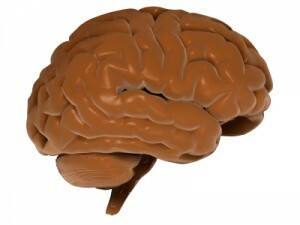 Lan and colleagues reported that several cortical regions related to cognitive appraisal, the subjective experience of emotion, and self-referential processing increased in volume following rTMS treatment: the anterior cingulate, the cingulate body, the precuneous, right insula, and gray matter in the medial frontal gyrus. The increases ranged from 5.3% to 15.7%, and no regions decreased in volume. More than 92% of the participants showed increased gray matter in all of these regions. The brain changes were not correlated with antidepressant response to rTMS, but suggest a possible mechanism by which rTMS is effective in some people. Lan and colleagues concluded that rTMS likely had neuroplastic effects in areas of the brain that are important for emotion regulation. There is growing evidence of a link between inflammation of depression. At the 2015 meeting of the Society of Biological Psychiatry, researcher Jeff Meyer summarized past studies on inflammatory markers. These are measurements, for example of certain proteins in the blood, that indicate the presence of inflammation in the body. Common inflammatory markers that have been linked to depression include IL-6, TNF-alpha, and c-reactive protein. At the meeting, Meyer reviewed the findings on each of these. Twelve studies showed that IL-6 levels are elevated in the blood of patients with depression. Four studies had non-significant results of link between IL-6 and depression, and Meyer found no studies indicating that IL-6 levels were lower in those with depression. Similarly, for TNF-alpha, Meyer found 11 studies linking elevated TNF-alpha with depression, four with non-significant results, and none showing a negative relationship between TNF-alpha and depression. For c-reactive protein, six studies showed that c-reactive protein was elevated in people with depression, six had non-significant results, and none indicated that c-reactive protein was lower in depressed patients. Most studies that have linked inflammation to depression have done so by measuring inflammatory markers in the blood. It is more difficult to measure inflammation in the brain of living people, but Meyer has taken advantage of new developments in positron emission tomography (PET) scans to measure translocator protein binding, which illustrates when microglia are activated. 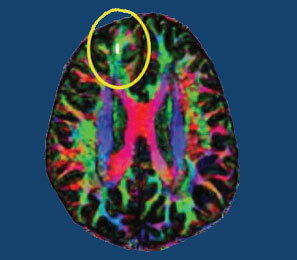 Microglial activation is a sign of inflammation. Translocator protein binding was elevated by about 30% in the prefrontal cortex, anterior cingulate cortex, and insula in study participants who showed symptoms of a major depressive episode compared to healthy control participants. The implication is that the depressed people with elevated translocator protein binding have more brain inflammation, probably via microglial activation. The antibiotic minocycline reduces microglial activation. It would be interesting to see if minocycline might have antidepressant effects in people with depression symptoms and elevated translocator protein binding. A new technology is making it possible to view the mammalian brain’s structure and connectivity for the first time. Karl Deisseroth discussed the technology, called CLARITY, at a plenary lecture at the 2014 meeting of the International College of Neuropsychopharmacology. The way CLARITY works is by replacing lipids in the brain with a hydrogel substance. This preserves the structure of the brain’s neural networks, leaves proteins and nucleic acids intact, but allows for observation by rendering the brain transparent. This can be done in a system as large as the entire adult mouse brain. 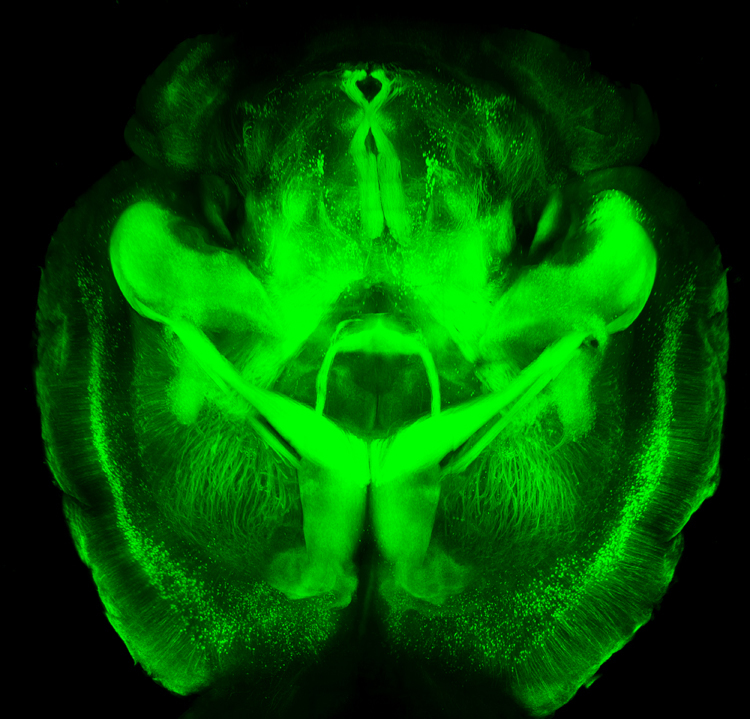 Early attempts took a whole day, but Deisseroth eventually found a way to render a mouse’s brain transparent in a matter of minutes. 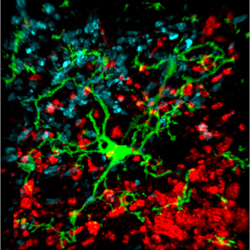 The pictures are truly amazing, allowing for the visualization of previously microscropic neurons, dendrites, axons and connections in life-sized images. Pictures and details are available at www.clarityresourcecenter.org. Deisseroth and colleagues have used CLARITY imaging to determine where neurons fire during different social activities. By placing photosensitive fibers in selected neurons using a virally based gene insertion technique, Deisseroth and colleagues were able to selectively fire dopamine neurons in the ventral tegmental area, part of the brain’s reward system, and thus increase or decrease the social interaction of mice by increasing or decreasing firing. The effects were selective to social interaction; the firing did not affect locomotor activity or exploration of an inanimate object. The ventral tegmental area contains neurons that project to several locations in the brain, and Deisseroth and colleagues hoped to observe which were important to social interaction. Stimulating the ventral tegmental area to drive the medial prefrontal cortex caused anxiety in the mice and made them averse to social interaction. However, when the ventral tegmental area was used to selectively drive the nucleus accumbens, another part of the brain’s reward system, social interaction increased. Deisseroth wanted to know if the nucleus accumbens was also involved in normal spontaneous social interactions. The researchers used a virus to insert an opsin-sensitive calcium gene that could give an ongoing readout of neural activity. (Opsin is a light-sensitive receptor found in cells in the retina.) The team found that the nucleus accumbens was implicated in social interaction with another mouse, but not in exploration of a novel object. Based on CLARITY imaging of the structure of ion channels (which are so small they cannot even be seen with an electron microscope), Deisseroth was able to selectively alter ion fluxes and turn neuronal firing on or off at will. In the last 50 years, the brain and its billions of neurons and hundreds of trillions of synapses have gone from complete inaccessibility toward increasing clarity. MDMA, better known as the drug ecstasy, has been found to reduce serotonin axons in animals. A small study by Di Iorio et al. published in the Archives of General Psychiatry in 2012 suggests that the drug also has detrimental effects on serotonin signaling in humans. The researchers used positron emission tomography (PET) scans to identify serotonin receptors in the brains of 10 women who had never used ecstasy and 14 who had used the drug at least five times before and then abstained for at least 90 days. The team found significantly greater cortical serotonin2A receptor nondisplaceable binding potential (serotonin2ABPND, an indicator of serotonin receptors) in abstaining MDMA users than in those women who had never used the drug. The increase in serotonin receptors observed in these ecstasy users could be a sign of chronic serotonin neurotoxicity. Loss of serotonin nerve terminals decreases serotonin levels and secondarily results in the production of more serotonin receptors. Thus, one explanation for the receptor increase is that it is prompted by the decrease in serotonin transmission that MDMA is known to cause. The higher levels of serotonin2ABPND were found in several regions of the MDMA users’ brains: occipital-parietal, temporal, occipito-temporal-parietal, frontal, and frontoparietal. Lifetime use of the drug was associated with serotonin2ABPND in the frontoparietal, occipitotemporal, frontolimbic, and frontal regions. There were no regions in which the MDMA users had lower levels of receptors than women in the control group. The duration of the ecstasy users’ abstinence from using the drug had no effect on levels of serotonin2ABPND observed, suggesting that the effects might be long-lasting, if not permanent. Editor’s Note: Given serotonin’s importance in brain function and the drug’s popularity for recreational use, this finding has implications both for ecstasy users and for research on serotonin signaling. 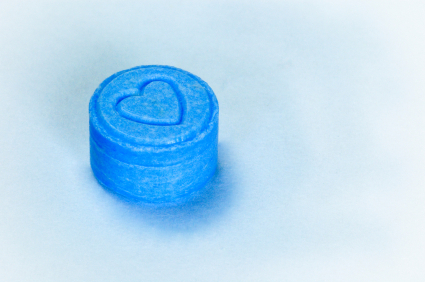 Ecstasy is supposed to be a “love drug,” but people should show their serotonin nerve terminals some love and look after them by avoiding the drug. New research shows that regular meditation in the form of mindfulness training improves both mood and measures of white matter (axon tract) integrity and plasticity in the anterior cingulate cortex (a key node in the brain network modulating self-regulation). This research by Tang et al. published in the Proceedings of the National Academy of Sciences in 2012 was a continuation of the same research group’s investigation of integrative mind-body training (IMBT), a type of mindfulness training that incorporates increased awareness of body, breathing, and attention to external instructions meant to induce a state of balanced relaxation and focused attention. In a previous Tang et al. study comparing participants who received IMBT training with a control group who spent the same amount of time doing relaxation training, the participants who practiced IMBT for five days (20 minutes/day) had better scores on measures of attention, anxiety, depression, anger, fatigue, and energy. In another study the researchers found that four weeks of IMBT (30 minutes/day) increased fractional anisotrophy (FA) in white matter areas involving the anterior cingulate cortex, while four weeks of relaxation training did not bring about any effect on white matter. Decrease in FA is a part of aging. The four weeks of IMBT also decreased axial and radial diffusivity, suggesting better alignment of axons along white matter tracts. In the most recent study, two weeks of IMBT (30 minutes/day) produced a reduction in axial diffusivity, but not effects on fractional anisotrophy or radial diffusivity, suggesting that the reduced axial diffusivity leads to the other changes seen with longer IMBT. Editor’s Note: In those with unresolved problems with anxiety and depression, regular 20-30 minutes/day mindfulness practice may have beneficial effects not only on mood, but also on central nervous system structures. Mindfulness training involves focused attention on sequentially different parts of the body leading to exclusive focus on the physical aspects of breathing in and out. Intruding thoughts are recognized, but let go as trivial, passing interruptions, and focus is returned to the body and breathing. The aim is to clear the mind of its usual ideas, thoughts, and worries by continually refocusing on breathing. It takes practice to achieve, but regular mindfulness training can be a helpful addition to pharmaco- and psychotherapy. It is also noteworthy that mindfulness training is one of the processes that helps elongate the ends of each strand of DNA, called telomeres. Telomeres shorten with aging, stress, and episodes of depression, and short telomeres lead to a variety of adverse medical consequences. Studies have indicated that lithium increases gray matter and the volume of the cortex and hippocampus in patients with bipolar I disorder. A poster presented by S. Selek et al. at the 5th Biennial Conference of the International Society for Bipolar Disorders described a longitudinal study of fronto-limbic brain structures in patients with bipolar I disorder during lithium treatment. This study reported that patients whose illness failed to respond to lithium had smaller right amygdalas than euthymic bipolar I patients or healthy controls. After treatment with lithium, those who responded well to the drug showed significant enlargement of the left prefrontal cortex and the left dorsolateral prefrontal cortex, while those who responded poorly to lithium showed decreases in the volume of their left hippocampus and right anterior cingulate cortex. Editor’s Note: This is one of several studies that suggest a relationship between volume of brain regions and degree of response to lithium. These data add to the remarkably consistent literature suggesting that lithium may have neurotrophic and neuro-protective effects, potentially because of the drug’s ability to increase neuroprotective factors such as BDNF and Bcl-2 while decreasing cell death factors such as BAX and p53. In two posters presented at the 2012 meeting of the American Academy of Child and Adolescent Psychiatry, a research group led by Kiki Chang reported that increased severity of manic symptoms is associated with increased size of the amygdala (especially the right amygdala) in adolescents who are at high risk for developing bipolar disorder. 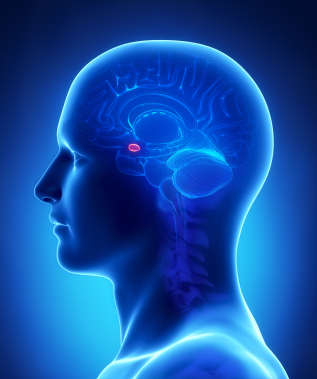 The amygdala is a crucial area for emotion regulation. The increasing size, either with more manic symptoms or as patients with bipolar disorder age into adulthood compared to normal volunteer controls (as we describe in the article on brain imaging at far left) could reflect increased use of the amygdala in bipolar disorder. The increased amygdala size could be linked to increased emotion dysregulation, or it could be a compensatory mechanism in which the amygdala works harder to exert better emotion control. Experience-dependent neuroplasticity describes a phenomenon in which the volume of a brain area increases as it gets more use (like a muscle that grows when it gets more exercise). One interesting example in which this may occur is London taxi drivers, who have larger hippocampi than the general public. (The hippocampus is responsible for some of the brain’s spatial recognition abilities.) This could be explained in two different ways. The discrepancy in size between the hippocampi of taxi drivers and of the general population may exist because the taxi drivers’ brains change over the course of their careers via experience-dependent neuroplasticity, or it may exist because those with excellent spatial recognition abilities and bigger hippocampi choose to become taxi drivers.